Three people have been arrested on the M1 in Derbyshire after a large quantity of drugs were seized from a car. 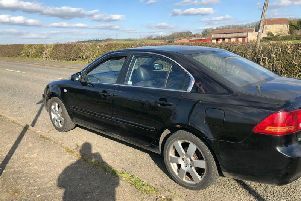 Derbyshire Roads Policing Unit seized the drugs after it emerged that the driver was unable to drive the car in a straight line on the motorway stretch. Police officers initially saw a small amount of drugs in the Ford vehicle, leading to the driver attempting a formal warning. However officers then found a large quantity of drugs with an intent to supply, including more than 100 individual deals and bags filled with cannabis. The driver then tested positive for drug driving and the three people inside the car were arrested. A spokesman for the unit said in a tweet: “That awkward moment when you try and get away with a formal warning for a bit of ‘personal use’ cannabis and then we find over 100 more deals.